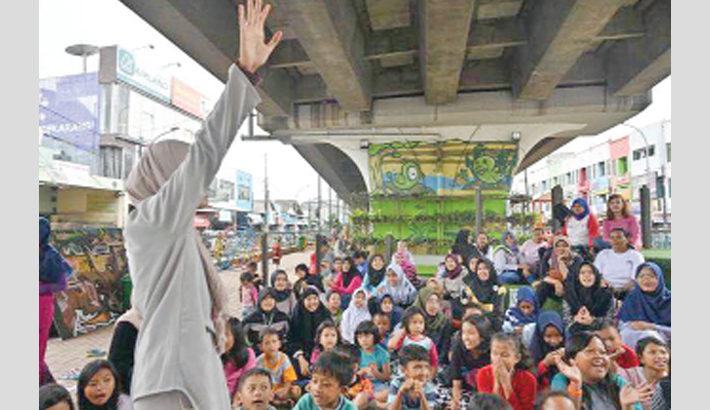 SOUTH TANGERANG: Singing and laughter briefly drown out the roar of cars under a Jakarta flyover, where an unlikely library for kids is thriving despite choking fumes—and opposition from menacing gangsters, reports AFP. There’s no quiet rule at this open-air reading park wedged between two lanes of traffic just outside Indonesia’s capital, a city of some 30 million that is notorious for having some of the world’s worst traffic jams. Despite its unlikely location, the Taman Baca Masyarakat Kolong has been a hit. A shortage of public libraries means it’s one of the few places where kids from this area can read books outside school.